A retired gentleman explores campgrounds in New England. Posting on campgrounds, gear, outdoors and my various adventures. 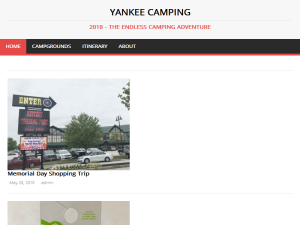 This what your Yankee Camping Blog Ad will look like to visitors! Of course you will want to use keywords and ad targeting to get the most out of your ad campaign! So purchase an ad space today before there all gone! The traditional first day of camping has finally arrived, but it looks gray and overcast outside, and the wind blew in the night. I just Read More The post Memorial Day Shopping Trip appeared first on Yankee Camping. The traditional first day of camping has finally arrived, but it looks gray and overcast outside, and the wind blew in the night. I just couldn't get myself excited to brave the crowds of campers that will be out this weekend, so I decided to keep the tent in the house for one more weekend and do some shopping instead. Surprisingly there was not a lot of traffic on the roads as I headed across New Hampshire and over the bridge into Maine. Finally, off the interstate and through the Kittery circle I suddenly discovered where everyone was - they had all gotten the same idea as I had and were taking advantage of a cloudy day to do some shopping at the Kittery Trading Post. I don't believe I have ever seen so many people in one place, except perhaps at a Red Sox game. The one parking spot I finally located was so far away I couldn't even see the store, but it was good exercise walking over there and while it was a lot of people it wasn't so crowded that my social anxiety kicked in. I took a turn around the super sale tent and then went directly to the camping section. As I have mentioned earlier I am a gear-aholic. I get almost as much pleasure from shopping for camping stuff as I do using it. I love my Coleman sleeping bag but have been thinking lately of something a bit lighter. So I spent some time looking over the selection. I have never been one who is comfortable sleeping in a mummy bag, so I was quite interested in the NEMO spoon-shaped bags. The idea that someone has come up with a sleeping bag that makes it comfortable to sleep on your side is great news. I didn't buy it, but it seemed well made and I could easily imagine myself all curled up inside. I did, however, spend some money while there. This tent peg lifter is a gizmo that just made sense. I can't tell you how many times I have driven a peg in too deep and spent half an hour digging down far enough so I could get it out, or worse, pulled on the tent flap only to have the loop rip off. Using the tent fabric to leverage a stuck tent peg is a no-no. In the past I have found the claw of a hammer to be helpful, but hopefully, this new gadget will make camping life just that much easier. We'll find out next week when I head to Massachusetts to Nickerson Park on Cape Cod. After shopping for an hour or so I headed next door to Bob's Clam Hut and had a bowl of fish chowder before heading home. All in all a relaxing day. Glad I didn't head to the lighthouse, it must have been mobbed. The post Memorial Day Shopping Trip appeared first on Yankee Camping. Frugal is a good Yankee word. I come from a long line of cheapskates and penny pinchers. My childhood included such fond(?) memories as riding Read More The post Free? Did someone say free? appeared first on Yankee Camping. Frugal is a good Yankee word. I come from a long line of cheapskates and penny pinchers. My childhood included such fond(?) memories as riding home with my parents in the car with my dad’s hand out one window and my mom’s out the other holding onto a couch they had picked up from the side of the road because it had a “free” sign on it. When my dad passed my poor sister, who was tasked with settling the estate, spent weeks cleaning out the garage which was filled to the ceiling with old balls of tin foil and twine, old motors, extension cords with only one end, rusty tools and leaky hoses. The metal alone fetched more than the house did. So when you say the word “free” you have my immediate attention. It’s in the blood. I can’t help myself. So when I came across this amazing web site: -Free Camping-, I just couldn’t help myself. If you have done much camping you know that a typical full service campsite can cost upwards of $30 per night for a stay, and are often booked months in advance. Even state campgrounds are in the twenties. I love to camp, but as a retired person on a very limited budget I find myself weighing the cost every time the urge to pack up the tent and get away from it all hits me. Now I have some options that open up possibilities I never expected. Now, there are a great number of sites on this list that are not what I would call camping sites – for example, Wallmart parking lots that let RV’s park over night. But if you dig a little there are some real gems. For example, look at this small five site campground just north of Eustis Maine. It features tables and fire pits (but no running water or toilet facilities). Quiet, lake access with kayaking and canoeing possible. This is what is known as dispersed camping, so called because it puts less pressure on the environment. I think from time to time about back country camping but am concerned about having to backpack everything in and being miles away from civilization. This sort of camp site sounds just perfect to me. Of course, being free, these camp sites are first come first served. You may arrive and discover that all five sites are already being used. That being the case it would be wise to have alternate plans in mind. Pick out several possibilities in the area to increase you chances of locating a spot. Plan on getting there well before dark so you have time to move to alternates or even to a pay site if you have too. Then, too, there is a whole etiquite involved with dispersed sites. There is no park ranger to clean up after you are gone. You need to have a trash management plan. Here is another site that list free camping opportunities: Campendium – fewer sites, but does filter out the RV stuff. You may also be interested in this USDA site on dispersed camping which lays out some of the specific challanges and responsabilities of dispersed camping. Of course, camping with no amenities may not appeal to some, even if it is free. If you are my age almost free is an option. I have in my hot little hands an America the Beautiful Senior Pass. This pass, which originally cost nothing, now goes for $20 for a single year or $80 for a lifetime pass. It entitles you to half off at many national park campgrounds and national forests. I used it last year on my trek to Blackwoods in Acadia and found it easy to use and elicited helpful information from park personel. If you plan on doing any amount of camping I would highly recomend it. The post Free? Did someone say free? appeared first on Yankee Camping. Some days are so busy it would be nice to just have a few minutes to sit and collect a thought or two. How strange Read More The post Kettle Pond appeared first on Yankee Camping. Some days are so busy it would be nice to just have a few minutes to sit and collect a thought or two. How strange it is that we have built a society where the chance to take a breath and reflect is almost an impossibility. Even in our recreation we tend to be hurrying to get there, hurrying up to do things so we can get back to take up the yoke of our busy lives. I have the feeling we are so isolated from leisure that we are often unable to really let go and relax. We are so used to being busy that it feels uncomfortable to just sit there and do nothing. Sometimes even when we are enjoying the outdoors we discover we have taken the city with us. I recall a time when I was sitting in a clam shack at the ocean’s edge waiting for my order when two well-dressed women came in and set at one of the rustic picnic tables. They waited about three minutes before getting up and leaving, upbraiding the poor waitress for “lack of service”. I will never forget the sound of their high heels clicking angrily along the wooden planks as they stormed out the door., all the while wondering to myself who in the world wears heel to the ocean anyway? In the nothingness that is enjoying the outdoors there is actually a lot to perceive. Once you let go and let the larger world begin to engage your senses there is an entire world of sounds and sensation, the quiet lap of water against a wooden dock, the caress of a breeze, the smell of water, the color of newly sprouted wild plants waking up from their long winter nap. It is a passive enjoyment that brings a relaxation through the entire body that no $200 massage could begin to equal. On this particular almost summer day I have driven to Kettle Pond in the Grafton State Forrest of Vermont. Parking at the trailhead it is a short hike of about a quarter of a mile into the boat launch where I manage to keep still for almost half an hour. The hike around the pond is about three miles and pretty level, but I leave that for another day as there is still quite a bit of mud along the trail. So my day consists of sitting and enjoying the lake, letting my thoughts drift like the clouds overhead, getting up when I have had enough and heading home not feeling at all like I have wasted my time. The post Kettle Pond appeared first on Yankee Camping. If there is one thing about me it is that I am a gearhead. It doesn’t matter if we are talking about kitchen gadgets or Read More The post Ozark Trails Cooler appeared first on Yankee Camping. If there is one thing about me it is that I am a gearhead. It doesn’t matter if we are talking about kitchen gadgets or electronic gizmos, I love them all and get great joy shopping for them and playing with them. So it was no surprise when a shelf of Ozark Trails coolers caught my eye at the local Wal-mart. There was a range of cool colors and they looked a lot like the Yeti coolers that I had been drooling over but just couldn’t justify buying. This cooler, however, was priced less than a c-note. It didn’t take much to make the decision and soon there I was at the checkout as the girl worked on getting it scanned. Then, out to the car with my new toy. The label said it would keep cook for between four and five days. My old cooler lasted maybe a day and a half. This was going to save me a lot of ice, or perhaps it was all advertising? A quick stop at the market and a seven-pound bag of ice went into the cooler along with a thermometer. The next day I went to check how things were doing inside and discovered how well sealed these units are. The air inside had cooled down to 32 degrees (duh) and the air had cooled with it, creating a vacuum inside the cooler. Getting the top open was a challenge. Wow. That’s well sealed. But would it last? Two days later, still 32 degrees inside. Nice. Day three, however, the ice was just about gone and the temperature was starting to rise. In the real world having food items inside the cooler might have extended the ice length, but what I got, although not the promised four-day span, was not bad. Now I faced the next problem. My old cooler has a drain. Just hang it off the end of the picnic table and depress the button until the water runs out. The Ozark trails has to be dumped, which can be a real bummer if your cooler is filled with assorted cans of soda and food items. I am looking into a small battery operated pump to solve this problem. There are some available reasonably from Amazon and I’ll let you know how that works out once I have some time to play with it awhile. While I was at it I headed back to Walmart and spent some time in the kitchen good section. There is nothing worse than a stick of soggy butter floating in half-melted ice, or a cooler that ends up smelling like hot dogs after a long weekend of camp activity. I wanted some sealable containers to keep things dry. While I was there, though, I discovered a rack that fits perfectly into the cooler. There is room underneath for 8 to 10 pounds of ice and still half of the 26 quarts of space is free and above the ice where it will stay cool and dry. Simpatico! Now all I need is some sort of metal can with a snap cover to set down in the ice so I can keep my Ben and Jerry’s at the proper temperature and I’ll be in heaven. Heres an interesting video on this cooler you might like. The post Ozark Trails Cooler appeared first on Yankee Camping. As the Lilacs start to bloom Vermont Campgrounds are busily preparing for the opening of campgrounds on Memorial day, just about two weeks from now. Read More The post 2018 Venture Vermont Outdoor Challenge appeared first on Yankee Camping. First, download a VVOC scorecard from this web page. Now, pick out interesting activities from the nine different categories and have some fun doing them. Take pictures of yourself doing them. Tally up the points. When you get to 250, submit the scorecard and pictures for free state park access for 2018 and 2019 plus a commemorative gold coin. This is going to be great fun. I will post about my progress and put a copy of my scorecard here on the website. Perhaps some of you who decide to take the challenge will post your results as comments here as well. Maybe a little friendly competition will develop to see who gets their 250 points first. Deadline is October 15. The post 2018 Venture Vermont Outdoor Challenge appeared first on Yankee Camping. The trees are blushing bud red on the shores of Grafton Pond. Birds have returned and the air has a definite warm feel, but the Read More The post Grafton Pond appeared first on Yankee Camping. The trees are blushing bud red on the shores of Grafton Pond. Birds have returned and the air has a definite warm feel, but the water is stone cold, a reminder of how short a time ago this lake was choked with ice, the smallmouth bass and yellow perch sleepily hanging snuggled in the muddy bottom some seventy feet below the surface. Here is a gem of a small lake hidden away on a back road, a secret pleasure known only to a handful of local fishermen and kayakers. Rarely crowded, here is a place where you can peacefully enjoy listening to water splash over the spillway or relax casting a line into the clear water from a vantage point on the edge of the dam, although most anglers bring small boats and make their way around to the back side of the pond. The real show, however, begins in the evening. You haven’t seen anything until you have seen the sunset here. Even on an off night its great, but on those special occasions when everything comes together its nothing short of spectacular. Tired kayakers paddling back to load their kayaks onto pickup trucks or car roof racks end up silhouetted by brilliant colors that highlight the shoreline on the islands that dot the lake. It's like a painting you once saw except for the fact that it's real and your right there. Then there is the wildfowl show. The pond is a nesting place for loon and it is common for there to be several nesting pairs in residence. In addition, there are also numbers of ducks and geese. All have their own particular distinctive calls, the loon mournful and low, the geese sort of a cross between a honk and a bark. You may see them during the daytime, but the evening is when they especially come out to cruise around the lake. At the moment there are just the pairs but in a few weeks the proud parents will be herding their offspring around and that is a sight not to miss. The post Grafton Pond appeared first on Yankee Camping. If you are the owner of Yankee Camping, or someone who enjoys this blog why not upgrade it to a Featured Listing or Permanent Listing?